Nanomaterials for Food Applications highlights recent developments in nanotechnologies, covering the different food areas where these novel products or technologies can be applied. 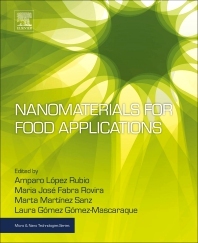 The book covers five major themes, showing how nanotechnology is used in food, the use of ingredients in nanoform to improve bioavailability or nanoencapsulation technologies, nanotechnologies for food processing, nanosensors for food quality and safety, nanotechnologies for food packaging, and methods to evaluate potential risks and regulatory issues. This is an important research reference that will be of great value to academic and industrial readers, as topics of importance, both at a research level and for commercial applications, are covered. Regulatory agencies will also be interested in the latest developments covered in the book as they will help set the foundation for further regulations. Amparo Lopez Rubio is permanent research scientist and project leader within the Novel Materials and Nanotechnology Group of the IATA-CSIC, Spain. She has published over thirty-five papers in peer-reviewed international journals on the subjects of food technology, nanotechnology, packaging and biopackaging. Maria José Fabra Rovira is a Ramón y Cajal fellow at the Food Quality and Preservation Department at the Institute of Agrochemistry and Food Technology (IATA-CSIC, Spain).Her research focuses on the development of highly functional biopolymers using nanotechnology. Marta Martínez Sanz is a Juan de la Cierva fellow at the Food Quality and Preservation Department at the Institute of Agrochemistry and Food Technology (IATA-CSIC, Spain). Her research focuses on the production and characterisation of polysaccharides extracted from renewable resources such as food and agriculture derived wastes and marine resources. Laura Gómez Gómez-Mascaraque is a researcher at the Institute of Agrochemistry and Food Technology – Spanish National Research Council (IATA-CSIC), Spain. Her research focuses on the development of edible, biopolymer-based microencapsulation structures.